Asics Noosa FF 2 are neutral performance running shoes. Keeping the flagship material FlyteFoam™ in Asics Noosa FF 2 is definitely great news and good indication that is performing well because there are no changes in midsole nor in outsole in current second edition. Although well known Gel® pad is available in the rear area, it is interesting that buzzword has been completely removed from official brand name where currently "FF" (from FlyteFoam™) gets all attention. 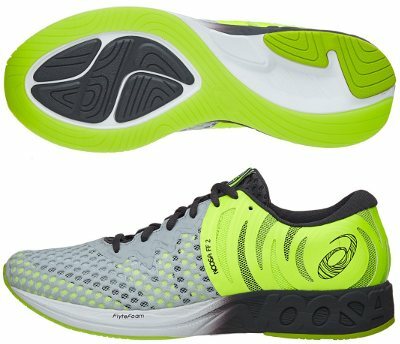 It is not clear yet if getting rid of pronation control (which is available in its peer Gel DS Trainer 23) and not so eye-candy design plenty of striking colours will match old successful market share especially when Asics has included another similar running shoe (RoadHawk FF) within its lineup. Many changes in upper compared with its predecessor Noosa FF looking to increase breathability in forefoot and more solid fit in the rest. Forefoot features multilayer mesh with multiple and pretty large ventilation holes that make visible the structure which provides overall consistency. Star-shaped overlays turn into more conventional and robust structure with fancy vertical apertures that wraps the midfoot for improved stability. As mentioned above, rest of Noosa FF 2 performs well and remains untouched featuring 10 mm drop and FlyteFoam™ midsole with Gel® pad in rearfoot to improve comfort in heel strikes. Noosa saga is closely linked to triathlon so brand name and all sports involved (swimming, cycling and running) are carved in midsole's wall in a very cool way. Outsole does not change either and keeps "wet-grip" concept for great traction on wet with harder rubber (AHAR) in more exposed areas to increase durability and softer one (DuraSponge) in the forefoot for quicker response.